World War I was a military conflict centered on Europe that began in the summer of 1914. The fighting ended in late 1918. This conflict involved all of the world's great powers, assembled in two opposing alliances: the Allies and the Central Powers. The first effect of the outbreak of the Great War in August, 1914, upon the people of the United States was one of utter amazement and stupefaction at the collapse of European civilization. On August 18 President Wilson issued a proclamation of I neutrality. Early in the war, however, the United States ^jpjind the position of a neutral a trying one. The situation was similar in many respects to that in Napoleon's day. The same vexing problems of neutral trade, of contraband, and of blockade once more arose. The United States had more than one occasion to protest against what seemed to be unwarranted interference with American trade by the British — an interference which the British justified on the grounds that the German Government had seized all the food supplies in the Empire, making all food products contraband, and that much of our trade with Germany's neighbors was actually finding its way into Germany, thus running the British blockade by indirection. The Submarine Warfare and the War Zone. Trade difficulties speedily sank into comparative insignificance, however, on account of the much more serious problem presented by the use of submarines. On February 4,1915, Germany declared the waters around the British Isles to be a war zone, within which zone it proposed to sink all enemy ships, whether armed or unarmed, and with utter disregard for the lives of passengers. On May 7 the world was horrified by the sinking of the unarmed Lusitania by a German submarine with a loss of 1152 lives, of whom 114 were known to be American citizens. President Wilson immediately dispatched a note to the German Government expressing the concern and amazement of the United States at such wanton destruction of the lives of noncombatants. A long series of notes followed, President Wilson trying by every means to avoid an open clash with Germany. At length, on May 4, 1916, he secured a qualified pledge that the German Government would not sink merchant vessels "without warning and without saving human life unless the ship attempts to escape or offers resistance." Ruthless Submarine Warfare. Following the Sussex pledge, just referred to, a certain degree of restraint was observed by German submarine commanders for a period of nine months, though often the precautions taken were very meager and haphazard. On January 31, 1917, the German Chancellor announced Germany's purpose to put aside all restraints of law and of humanity and use its submarines to sink every vessel that sought to approach the ports of Great Britain and Ireland or the western coasts of Europe or any of the ports controlled by the enemies of Germany within the Mediterranean. Said the German Chancellor on this occasion: "When the most ruthless methods are considered the best calculated to lead us to victory and to a swift victory, they must be employed. That moment has now arrived." The new policy swept every restriction aside. Vessels of every description, whatever their flag, their character, their cargo, their destination, their errand, were ruthlessly sent to the bottom without warning and without thought of help or mercy for those on board. Even hospital ships and ships carrying relief to the sorely bereaved people of Belgium, ships to which Germany had guaranteed safe passage, were sunk with the same reckless disregard of compassion or of principle. The German ambassador to Argentina even advised that certain Argentine vessels be sunk without leaving a trace. In all, before April, 1917, 686 neutral vessels had been sunk by German submarines, and 226 American citizens had been the victims of Germany's submarine warfare. Said President Wilson: "Property can be paid for; the lives of peaceful and innocent people cannot be paid for. The present German submarine warfare is a warfare against mankind." Position of the United States. The Government and people of the United States had been amazed at the violation of Belgian neutrality; they had been horrified by the sinking of the Lusitania; they had listened unbelievingly to the tales of German cruelty to women and children in conquered territory; they had been dumfounded at the effrontery of the German Government's replies to President Wilson's many notes. Now they were roused to action. It was plain that the most sacred rights of our nation and our people were being ignored and violated. In March it was revealed that the German Government, in January, 1917, before there were any indications of hostile action on our part, had tried to induce Mexico and Japan to join in a war against us. German money was being spent freely to influence public and congressional opinion. It was plain that the peril was nearer than we had dreamed. The very existence of democratic governments was threatened by the Prussian autocracy. The course of the German Government became in fact nothing less than war against the United States, and on April 2 President Wilson asked Congress to declare that a state of war with Germany existed. Congress acted with surprising unanimity, and on April 6 the momentous resolution was formally passed. The New Purpose in the War. Whatever may have been the motives of the nations in beginning the Great War, the Russian revolution and the entrance of the United States into the struggle have given it a new purpose. It has become a war of Democracy against Autocracy, a war to determine whether the ideals of America or the ideals of Prussia are to rule the world. We are now in a state of necessity, and necessity knows no law. Our troops have occupied (neutral) Luxemburg and perhaps already have entered Belgian territory. Gentlemen, this is a breach of international law. The wrong — I speak openly — the wrong we hereby commit we will try to make good as soon as our military aims have been attained. He who is menaced as we are, and is fighting for his highest possession,' can only consider how he is to hack his way through. The question of right is an affair of ministers. ... It is time to consider it in secret, for the orders to my troops have been given. Take what you can; you are never wrong unless you are obliged to give back. As soon as you come to blows with the enemy he will be beaten. No mercy will be shown! No prisoners will be taken! As the Huns, under King Attila, made a name for themselves, which is still mighty in traditions and legends, may the name of German be so fixed in China by your deeds that no Chinese shall ever again dare even to look at a German askance. . . . Open the way for Kultur once for all. Against this set the words of the first president of the young American republic, speaking at a time when the nation was so weak that surely any kind of shifts could have been justified on the score of necessity. The foundation of our national policy will be laid in the pure and immutable principles of private morality, and the preeminence of free government be exemplified by all the attributes which can win the affections of its citizens and command the respect of the world. Observe good faith and justice toward all nations; cultivate peace and harmony with all. ... It will be worthy of a free, enlightened, and, at no distant period, a great nation, to give to mankind the magnanimous and too novel example of a people always guided by an exalted justice and benevolence. With malice toward none, with charity for all, with firmness in the right as God gives us to see the right, let us finish the work we are in, to bind up the nation's wounds, to care for him who shall have borne the battle, and for his widow and his orphans, to do all which may achieve and cherish a just and lasting peace among ourselves and with all nations. We are accepting this challenge of hostile purpose because we know that in such a Government, following such methods, we can never have a friend; and that in the presence of its organized power, always lying in wait to accomplish we know not what purpose, there can be no assured security for the democratic Governments of the world. We are now about to accept the gauge of battle with this natural foe to liberty, and shall, if necessary, spend the whole force of the nation to check and nullify its pretensions and its power. W7e are glad, now that we see the facts with no veil of false pretense about them, to fight thus for the ultimate peace of the world and for the liberation of its peoples, the German peoples included; for the rights of nations great and small and the privilege of men everywhere to choose their way of life and of obedience. The world must be made safe for democracy. Its peace must be planted upon the tested foundations of political liberty. We have no selfish ends to serve. We desire no conquest, no dominion. We seek no indemnities for ourselves, no material compensation for the sacrifices we shall freely make. We are but one of the champions of the rights of mankind. We shall be satisfied when those rights have been made as secure as the faith and the freedom of nations can make them. Just because we fight without rancor and without selfish objects, seeking nothing for ourselves but what we shall wish to share with all free peoples, we shall, I feel confident, conduct our operations as belligerents without passion and ourselves observe with proud punctilio the principles of right and of fair play we profess to be fighting for. July 28, 1914: Austria-Hungary declares war on Serbia. August i, 1914: Germany declares war on Russia. August 3, 1914: Germany declares war on France. August 4, 1914 (a.m.): Germany invades Belgium. August 4, 1914 (p. M.): Great Britain declares war on Germany. August 6, 1914: Austria-Hungary declares war on Russia. August 8, 1914: Montenegro declares war on Austria-Hungary. August 23, 1914: Japan declares war on Germany. October 29, 1914: Turkey attacks Russia. May 23, 1915: Italy declares war on Austria-Hungary. October 14, 1915: Bulgaria declares war on Serbia. August 28, 1916: Rumania declares war on Austria-Hungary. April 6, 1917: United States declares war on Germany. 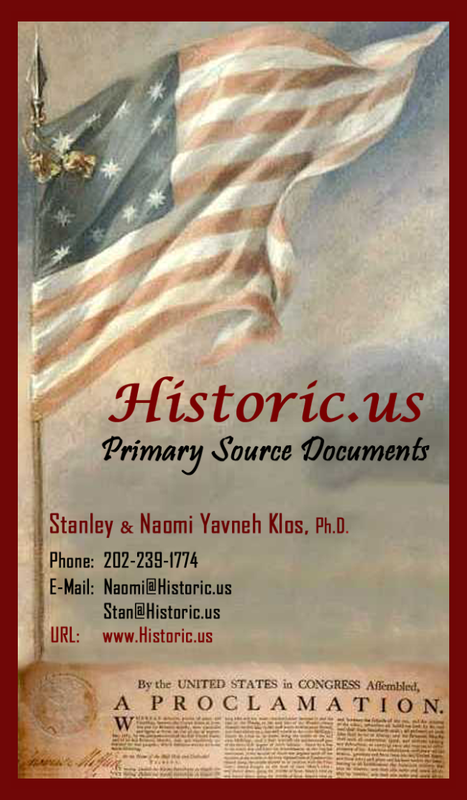 Book a primary source exhibit and a professional speaker for your next event by contacting Historic.us today. Our Clients include many Fortune 500 companies, associations, non-profits, colleges, universities, national conventions, PR and advertising agencies. As a leading national exhibitor of primary sources, many of our clients have benefited from our historic displays that are designed to entertain and educate your target audience. Contact us to learn how you can join our "roster" of satisfied clientele today! Primary Source exhibits are available for display in your community. The costs range from $1,000 to $35,000 depending on length of time on loan and the rarity of artifacts chosen. ** Acting US President - David Atchison never claimed that he was the President of the United States for one day on March 4, 1849. Political Scientists who make the assertion claim that because Zachary Taylor refused to be sworn in on a Sunday, March 4, 1849, and both the President and Vice President's term ended on that date the President pro-tempore of the U.S. Senate, David Atchison, therefore became the President under 1849 Presidential succession law.